Location/ Directions: I-395 N toward Washington. Turn right onto New York Ave NW/US-50. Turn right onto Florida Ave NE. Turn right on 2nd Street NE. About Hotel: BRAND NEW. 8-Stories, 218-Rooms, Interior Corridors, High-Speed Internet, On-site parking (fee), Pets not allowed, Air conditioning, Alarm clock, Coffee/tea maker in room, Crib, Individual climate control, Internet browser/Web TV, Iron and ironing board, Mini fridge, Roll-away bed, Hair dryer, Color Cable/satellite TV with CNN/ESPN/HBO, Phone with voice mail, Restaurant & Lounge (on-site), Fitness Center, Indoor pool. Railroad View: Excellent View. 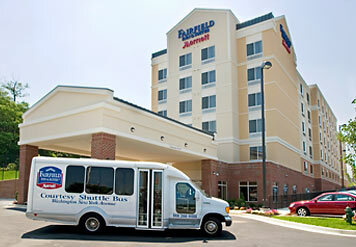 Located next to Amtrak's Northeast Corridor and the New York Avenue station of the Washington Metro. Get a room on the east or north side of the hotel for a railroad view. Rooms on floors 5-8 are needed for a railroad view. 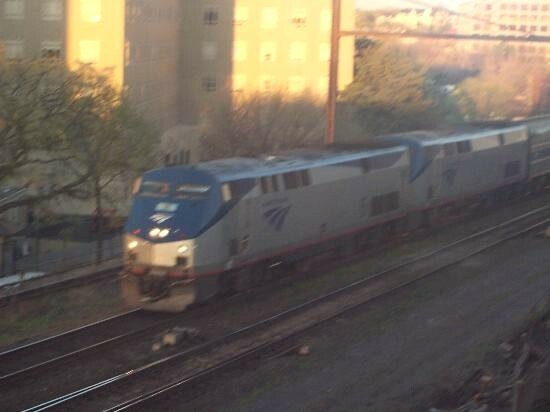 Railroads past Hotel: The Northeast Corridor - Amtrak / MARC (commuter railroad) / Washington Metro (Rapid Transit). 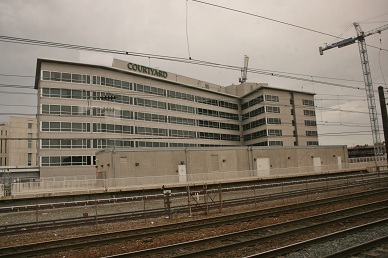 Photo Comment: Right: The Courtyard is seen from a passing Amtrak train. The two tracks closest to the hotel belong to Washington Metro, the rest are Amtrak. The power structure located on the platform of the Metro fouls the view from lower floor rooms. Rooms on the 5th to 8th floor are above the building. The crane to the right side of the photo represents a sample of what you see all around Washington, construction and building! 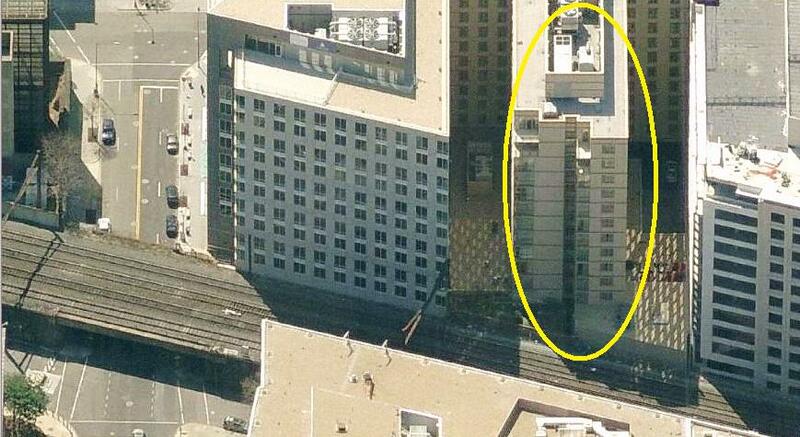 Aerial Photo: The building featured in this photo is the Courtyard Hotel. Its located directly next to Metro's New York Avenue station, and along side Amtrak's Northeast Corridor. As you can see, this hotel has an excellent view of the passing trains! 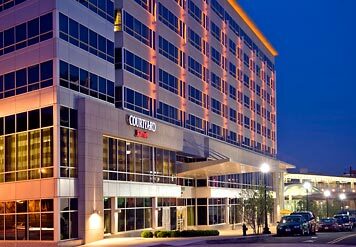 About Hotel: 7-Stories, 134-Rooms, Interior Corridors, Free WiFi, Guest Laundry, Outdoor Parking (fee), Bus & Truck Parking, Free Coffee, Free Hot Breakfast, Speaker Phone, No Pets Allowed, Business Center, Exercise Room, Elevator, Courtesy shuttle to and from Union Station/Metro. Railroad View: Excellent View! Any room on a high floor on the rear side of the motel will give you a railroad view. Motel is located right next to the railroad. Notes: This is a former Comfort Inn hotel. 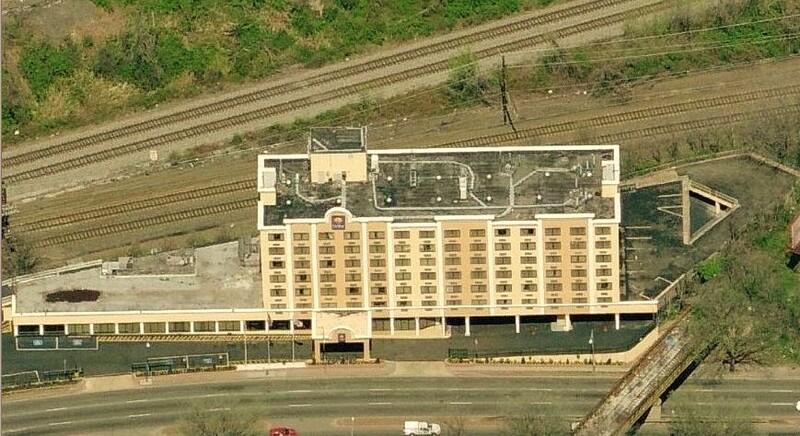 Photo Comment: The aerial picture show the excellent view that the Quality Inn has of the railroad. Of the 4 tracks seen behind the motel, the closest two are Amtrak's Northeast Corridor, also used by MARC and known as the Penn Line. The other two tracks (with lighter colored ballast) is the CSX line between Washington & Baltimore (former B&O), its also used by MARC commuter train's and referred to as the Camden Line. The Camden Line is non-electrified, meaning diesels are used to power train's on the Camden Line. This motel should provide a nice mix of train's. Also of note is a bridge on the front side of the motel, this is an abandoned railroad bridge. The rails are still in place on the bridge, but the spur has been disconnected from the mainline. It once served as a connecting track to local business in an industrial area across from the motel. Today, the only business surviving in that area is light industrial, and small retail. Location/ Directions: I- 95, take exit 2B to MD295, exit onto New York Avenue 50W. Hotel is on the left before the Bladensburg Road intersection. About Hotel: BRAND NEW. 6-Stories, 126-Rooms, Interior Corridors, High-Speed Internet, On-site parking (fee), Pets not allowed, Air conditioning, Alarm clock, Coffee maker/tea service, Crib, Individual climate control, Iron and ironing board, Mini fridge, Hair dryer, Color Cable TV with HBO/CNN/ESPN, Microwave oven, Speakerphone with voice mail, Grab-n-Go Breakfast, Exercise Room. Railroad View: Good View. High floor rooms on the railroad side will give you a railroad view. Other rooms on the long end of the building will also provide a view, but it will an angled view. Photo Comment: Aerial view shows the Fairfiled Inn being the building to the left, near the tree's. The railroad can be seen to the right. Its a distant view, but the railroad is elevated. 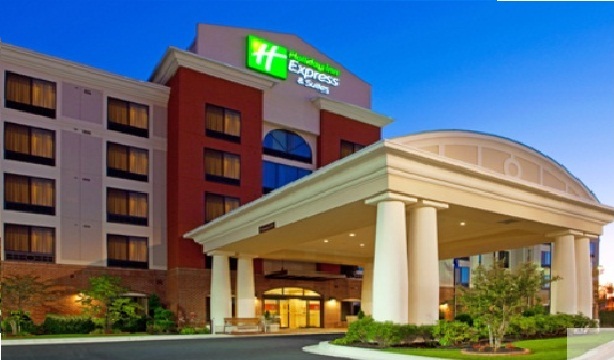 The building to the top right is the Holiday Inn Express, also listed on this web site. Both motel's are brand new. Location/ Directions: I-395 North, continue 1.2 miles. Go across the bridge and bear Right onto the Southwest Freeway. Make a Right at the Maine Ave. exit, continue up ramp. Make a Left onto G St., SW, continue to intersection. Make a Left onto 7th St., SW., continue .2 mile. Make a Right onto E St., SW, continue .3 mile. The hotel is on the Left, between 4th St., SW and 3rd St., SW.
About Hotel: NEW Hotel. 13-Stories, 233-Rooms, Interior Corridors, High-Speed Internet, Pets allowed (fee), Air conditioning, Alarm clock, Coffee maker/tea service, Crib, Individual climate control, Iron and ironing board, Safe, Hair dryer, Color Cable/satellite TV with HBO/ESPN/CNN, Conventional oven, Dishwasher, Microwave oven, Pots, pans, serving dishes, Refrigerator with ice-maker, Silverware, Stove, Table and chairs, Toaster, Two-Line Speakerphone with voice mail, Buffet breakfast, Coffee/tea in-room, Hotel Fitness Center, Indoor Pool, Whirlpool, On-site parking (fee) - Limited parking spaces available in hotel garage - first come first serve basis. Railroad View: Good to Excellent View, depending on room. Only a small group of rooms face the tracks directly. Others face building's next-door with an sharp angled railroad view. North-side rooms face the railroad directly, if they are unavailable, try to get a room on the east side near the railroad. Photo Comment: A guest shot a photo of a southbound Amtrak train, taken from a room on the east-side near the railroad end of the building. Aerial view looks south. The motel is sandwiched between two office buildings. A room on the backside of the building (north-side) would be ideal for a view. If you can't get a north-side room, try for the east side near the railroad. Any floor should be fine. This is a busy stretch of railroad, hosting all passenger train's south of Union Station, and CSX freight train's. 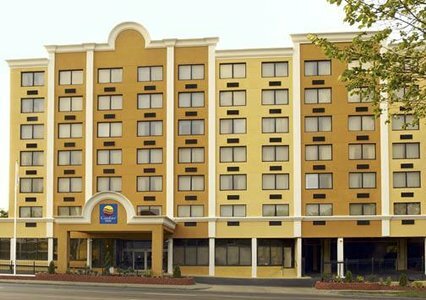 About Hotel: 5-Stories,125-Rooms, Interior Corridors, Business Center, Free Morning Newspaper Delivered to Room, Color Cable / Satellite TV, Stereo, Work Desk w/ Lamp, Phone with Voice Mail, Direct Dial Phone, Free Local Phone Calls, High-speed Internet Access, Bathtub, Hairdryer, Private Bathroom, Coffee Maker, Microwave Oven, Mini Refrigerator, Tea Maker, Connecting Rooms, Crib, Double Glazed Windows, Individually Controlled Air Conditioning, Iron / Ironing Board, Roll-away Bed/Cot, All rooms non smoking, Health and Fitness Center (On-site), Whirlpool, High-speed Internet Access, Indoor Pool, Housekeeping and Laundry Services, On-site Guest Self-Laundry Facilities (washer/dryer), Ice Machine, Porter/Bellman. Railroad View: Good View. Any room on the front of the building 2nd floor or higher should give you as good railroad view. Photo Comment: WOW....Pennsylvania Rail Road used some good paint! Its been 43-years PLUS since this bridge was painted, and it still looks this good! The Holiday Inn Express is circled in yellow, as seen down Blandenburg Road. Never-mind that Days Inn motel sign you see near the bridge. Days Inn doesn't have any rooms with a railroad view.